NASA engineers Neerav Shah and Phil Calhoun will realize a long-held ambition later this year when a Space-X launch vehicle deploys two tiny satellites that will fly in a precise formation to create, in effect, a single or "virtual" telescope benefitting a range of scientific disciplines. Through a NASA international agreement, Shah and his team have partnered with South Korea's Yonsei University and the Korea Aerospace Research Institute (KARI) to validate technologies that would allow a pair of miniature spacecraft to fly in tandem along an inertial line of sight toward the sun and then hold that configuration—a feat not yet performed in space. 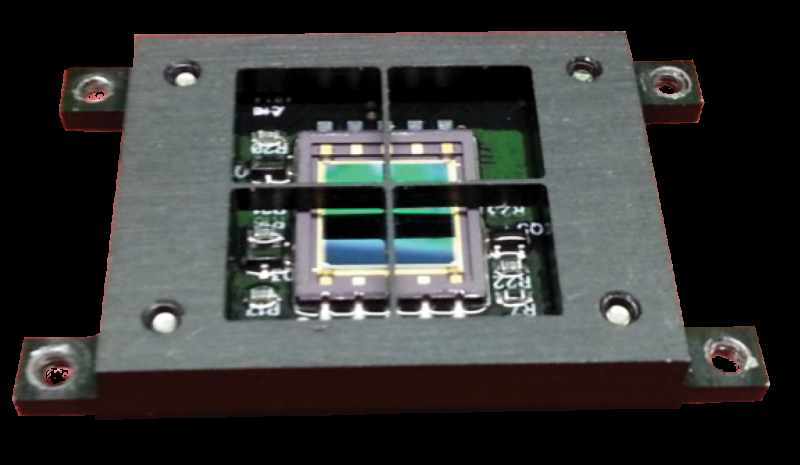 Called CANYVAL-X, short for the CubeSat Astronomy by NASA and Yonsei using Virtual Telescope Alignment eXperiment, the technology-demonstration mission is expected to launch in mid-2016 aboard a SpaceX Falcon launch vehicle. "The key differentiator with our mission is that we are attempting to align two satellites along an inertial line of sight to a distant celestial target and hold them in alignment for a long enough time to make a science measurement," said Shah, an engineer at NASA's Goddard Space Flight Center in Greenbelt, Maryland. "Although others have flown two or more satellites in tandem, we are the first in the world to even try holding them in alignment to a distant source." Currently, the European Space Agency (ESA) is developing Proba-3, a large-scale science experiment that will fly a pair of satellites in a tight formation to form a 492-foot-long solar coronagraph to study the sun's faint corona, the outer atmosphere. Unlike CANYVAL-X, which is designed to test only the alignment technologies, Proba-3 also will gather scientific measurements. According to ESA, however, the mission isn't expected to launch until the end of 2018. The technology's obvious beneficiaries are scientists who study the sun's corona and more particularly coronal mass ejections that hurl enormous bubbles of superheated gas across the solar system. Traveling at a million miles per hour, they can disrupt low-Earth-orbiting satellites and terrestrial power grids when they strike Earth. The technology also could benefit scientists searching for planets beyond the solar system. Both scientific disciplines rely on coronagraphs, which employ an occulter mask to block bright starlight to reveal faint objects hidden by the star's bright light and a camera or spectrograph to gather measurements. Today, space-based coronagraphs house both the occulter and a camera or spectrograph in the same telescope, positioning them relatively close to one another. Some scientists believe, however, that they could gather even more detailed information if they positioned the occulter hundreds of feet away from the camera or spectrograph. A case in point is the moon, itself. When aligned with the sun—called an eclipse—the moon provides a near-perfect coronagraph. "Creating a single telescope that achieves these distances is not possible. It would be too large to launch into space," Shah said. A solution is launching two spacecraft—one that carries the occulter disk, the other the science instrument. Flying these devices on two separate spacecraft that are precisely aligned to the target of interest solves this challenge, he added. "Formation flying offers the ability to increase the separation distances, which leads to reduced diffracted light." "Actually any mission where you need to fly in tandem to gather a measurement, would certainly benefit," Shah said. "If we demonstrate the concept, we will enable the next-generation of space telescopes." 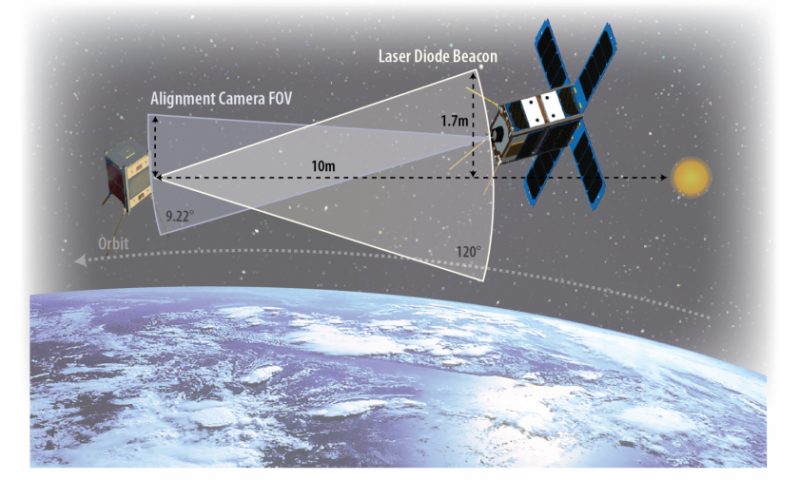 Under the CANYVAL-X technology demonstration, the team plans to position a 2U and a 1U CubeSat in a 435-mile sun-synchronous orbit, where the two will maintain a tight alignment along a line of sight to the sun. The larger of the two spacecraft will carry two Goddard-provided technologies that make up the mission's all-important guidance, navigation and control (GN&C) system: a miniature sun sensor and the micro cathode arc thruster (mCAT) system. Developed at the Wallops Flight Facility in Virginia's Eastern Shore, the sun sensor calculates a direction to the sun. The George Washington University (GWU)-designed micro-cathode arc thruster (mCAT) system, which is about the size of a coffee mug, fires its thrusters to move the spacecraft so that it maintains its alignment with the smaller CubeSat separated by nearly 33 feet. Under the collaboration established by the international agreement, Yonsei and KARI are providing the two spacecraft, integrating the Goddard-supplied sun sensor and GWU-Goddard mCAT system, and launching the spacecraft. "We want to show that the architecture works," Shah explained. "We have all the technology to keep an alignment." Once he and his partners show the capability, they plan to prepare another mission that would gather scientific data. "Once we do this modest demonstration, we can scale up. We're taking baby steps."